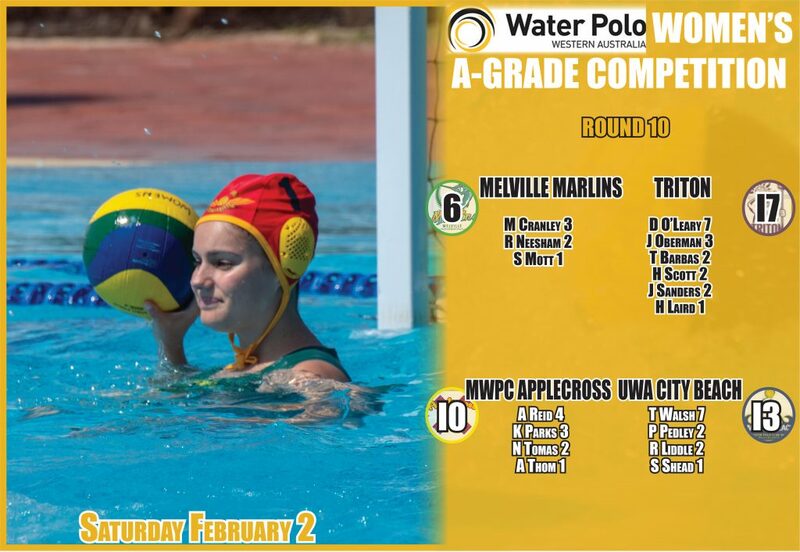 Things got back underway on Saturday with both games held at Bicton Pool with Triton defeating Melville Marlins and UWA City Beach beating Applecross 13-10. Both the Marlins and Applecross were missing players due to the Fremantle Marlins spending the weekend opening their 2019 AWL season with two wins against the Adelaide Jets. Saturday’s win for UWA City Beach sees them improve to a 7-3 record to move to top spot in the standings ahead of Melville Marlins (6-3, one draw), Applecross (5-4, one draw) and Triton (4-6). Saturday’s action at Bicton Pool got underway with the Melville Marlins taking on Triton. Triton started impressively with the opening three goals thanks to Dayna O’Leary with the first two and another from Jenna Sanders. The Marlins did get on the board just before quarter-time with a goal to Megan Cranley and then with the first two goals of the second term to Rose Neesham and Cranley scored were all square at 3-3. But Triton responded well to pull away and lead 8-4 by half-time and that had grown to 12-6 by three quarter-time, and 17-6 by the final buzzer thanks to a five-goal to nil fourth period. Dayna O’Leary scored seven goals for Triton, Jamie Oberman three, Heather Scott two, Tayla Barbas two and Jenna Sanders two. Megan Cranley finished with three goals for the Marlins and Rose Neesham two. O’Leary received the three votes, Sanders two and Cranley one. The second game of the afternoon then featured Applecross against UWA City Beach. It was Applecross who scored first thanks to Kelly Parks before City Beach answered through Pippa Pedley. Things stayed tight until just before half-time UWA scored the last two goals from Tayla Walsh and Sam Shead to go into the change of ends leading 7-5. City Beach was still leading 9-7 by three quarter-time but a couple of early fourth quarter scores for Applecross from Amity Reid and Alyssa Thom to be back within just one. But goals for UWA City Beach to Walsh, Walsh again and then Rebecca Gibb saw them win 13-10. Tayla Walsh hit seven goals for City Beach, Rebecca Liddle two and Pippa Pedley two. Amity Reid finished with four goals for Applecross, Kelly Parks three and Nina Tomas two. Walsh received the three votes, Reid two and Parks one.